A six hour endurance event, but it all came down to a five lap shoot out at the end – in both the DP and GT classes. Having led almost all the way, the Bell Motorsports Doran Chevrolet, driven by Didier Theys for the last stint, was passed at Turn 1 by Scott Goodyear, third driver in the #58 Brumos entry, with less than two laps to go. Similarly in the GT class, Johannes van Overbeek used the yellows to have fresh tyres fitted, which allowed him to gobble up the advantage held by the Washington Ferrari of Brent Martini. GTS was more clear cut, the Heritage Motorsports Mustang recovering from a rapid gearbox change to finish tenth overall, but 25 laps down on the overall winner. The weather was still a factor before the race, because the ‘pole-sitter’ – the #59 Brumos car – made a late change to slicks and didn’t leave the pitlane in time to join the grid. The sister car started from the back, because it wasn’t fitted with its marked tyres. With Forest Barber missing the race to be with his poorly daughter (thankfully OK after falling from her horse), that was enough pre-race drama. So Borcheller and Law (Picchio BMW) led the field away, the former pulling out a big lead very quickly, as Donohue and Haywood fought through the backmarkers in the Porsche-powered cars. The Rennwerks GT Porsche was initially third, from the Cegwa DP and the Essex Lola – with the Brumos cars about to join them. Darren Law seemed to be struggling in the Picchio, having more than one spin – although light rain was a factor. The Toyota powered Fabcar moved up to second, but Terry Borcheller was long gone, 40 seconds up the road by lap 11. That advantage was negated by a full course caution to retrieve the stalled Picchio after another spin. Pit stops under yellow saw the other four DPs in the order Doran, Fabcar-Toyota, Brumos, Brumos – so pre-race problems for the #58 and #59 cars had effectively been overcome already. The next caution interrupted a race between Borcheller and Haywood for the lead: the Cegwa car was in fuel supply problems, which would lose it several laps. Under the green flag, the order quickly became Borcheller – Haywood – Donohue. 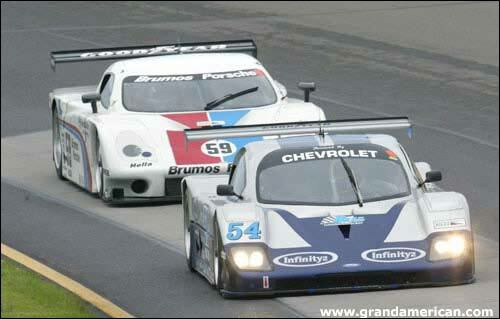 More or less at one hour, the Brumos cars switched positions, and Borcheller led by six seconds. Rennwerks led GT. The Mosler was an early retirement from GTS, in electrical difficulties, one bank of the V8 not firing. The next half hour saw Donohue close on Borcheller as the track became really dry, these two right together when the Picchio DP stopped on the course again, bringing out another full course caution. The leader handed over to Didier Theys, David Donohue staying in for what turned out to be a monster stint in #58. The Picchio was repaired, Geoff Bodine taking the wheel for the first time. Nearly half an hour of racing time was lost because the #06 Corvette – which had been the class leader – hit the wall under the yellows, spreading fluids on the track and extending the caution. Passing the two hour mark and Donohue – still at the wheel, with plenty more to come – inched out a lead over Didier Theys. The next four hours would see most of rest of the race continue to be between these two. Approaching three hours and David Donohue finally relented and let Mike Borkowski take over, after a superb drive. Donohue: "I asked them if I could stay in, I was OK to go, and then the car really deteriorated. They were able to tune a lot of that out, at least.” Theys exchanged with Borcheller, but the #58 stayed out front. Chris Dyson got into the #59 Brumos car for his first race drive in a DP. Elsewhere, the Heritage Mustang pitted for its transmission change (allowing the Re / Max #05 car to lead the GTS class), while the Marcus BMW, from third in GT, pitted to have axle problems attended to. Just after three hours and the other Picchio was in trouble, the SRPll machine colliding with the only other SRPll in the field, the Essex Lola: the Picchio needed help, so the yellow flags were shown all round the track for another caution, but the Lola would go no further (suspension damage). Terry Borcheller used the caution to pit for a suspension adjustment, losing a place to Chris Dyson, but the Doran Chevy was soon up to second again once the green flags were shown. Approaching three and a half hours and Borcheller’s suspension tweak seemed to have done the job as he passed Borkowski for the lead – only for another full course caution to commence, this time to retrieve one of the Cup Firebirds. 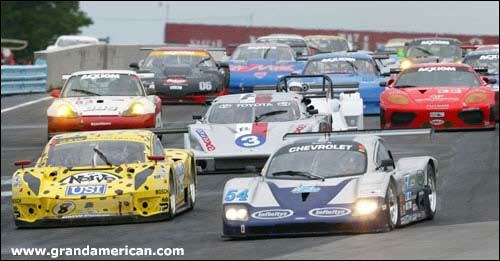 Borcheller and Dyson pitted, Borkowski didn’t – so #58 was back in the lead. But within four laps of the green flag on lap 98, Borcheller passed Borkowski again – with about two and a quarter hours remaining. 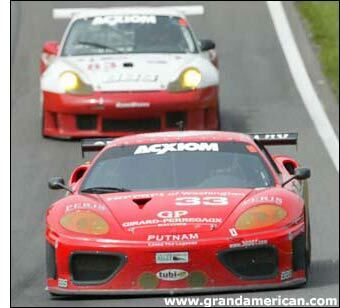 The Rennwerks Porsche was a lap ahead in GT at this stage. Either side of four hours, Chris Dyson in #59 caught and then passed Mike Borkowski in #58, but Borcheller was moving away into a 15 second lead. #58 then pitted, leaving Dyson in a secure second, but he had the misfortune to arrive first at the scene of the GTS leader’s engine oil on the track. #05 had thrown a rod, so the race lost the GTS leader and the second placed car overall in almost the same moment, Dyson slithering off and causing enough front end damage to put the #59 out of the race. The delayed Heritage Mustang (eventually) became the new GTS leader. Another full caution saw Borkowski hand over to Scott Goodyear, leaving Borcheller ahead at the green, and stayed ahead until almost the five hour mark – when he pitted for Theys to complete the race. At this point, the Rennwerks Porsche passed the Ferrari to unlap itself, but the gap was much closer when the Ferrari made a regular stop with 40 minutes left. At the front, Theys looked to have the race in the bag, the Doran entry comfortably ahead for a change. With 20 minutes left the gaps in both significant classes were about 20 seconds – but the chasing cars were both quicker than the chased. Time for another Picchio-inspired caution, this time as the SRPll stops on the track – with what turns out to be nine laps remaining. “We needed that yellow, because those guys had a splash and go,” said Goodyear after it was all over. The #83 Porsche used the caution to take on fresh tyres (and fuel), and Johannes van Overbeek against Brent Martini (on worn tyres) was only going to end up one way: van Overbeek gobbled up the Ferrari with laps to spare. With four laps to go, Goodyear was a second and a half behind Theys, and starting the penultimate lap, muscled by at Turn 1. The Doran Chevy had led the bulk of the race, but didn’t lead the important last lap (or the one before). A puncture dropped it further from #58 than it had been throughout the event. “On the restart, I had to get by those lapped cars in front of us, and then I had to have a shot at it in turn one, because they had more power than us,” explained Scott Goodyear. “I was losing down the straightaway, I could only do it in the turns or under braking. We were lucky we got it done. Didier actually turned into me a little bit, tried to close the door, then he whacked me - that was some NASCAR rubbing going on, but it was fun." Terry Borcheller: "Just frustrating. I'm still in shock. Everybody did the best job they could do, which was a great job, and to come up second is a heartbreaker." The next race is at Mid-Ohio this coming weekend.